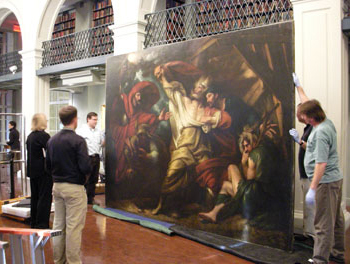 Project services incorporate the entire range of U.S.Art’s services through our international network including; packing, crating, transportation, storage, installation and rigging of artwork in any medium. We can also provide on-site project management for institutional and private collection relocations, with special emphasis on the planning and execution of multi-phased or long-term projects. Working with you, we will design, produce or procure specialized packing as well as specialized international transportation systems to suit your needs. At your request we will coordinate and directly supervise sub-contracted services and put our name behind the total project package. United States to the UK!